Cheddar Bacon Soup | Low Carb! Matt would rather go hungry than have a bowl of soup. I know, it's crazy. 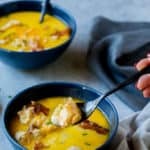 I love soup, so obviously this Cheddar Bacon Soup recipe is for me and all the other soup lovers out there. It's rich, creamy and super filling. This would be one of my favorite meals to eat at my desk during a cold winter day! Before keto, whenever I ate out, I would often get the soup instead of the salad that preceded my main meal. Naturally, I picked the least fatty and least flavorful sounding one, thinking I was doing myself a favor. If you don't know what soup I'm referring to... It's minestrone haha. Now, I would definitely opt for the salad because you never know what they are adding to the soup. It can be sugar to slightly sweeten it up without you even realizing it, or corn starch which is commonly used a thickening agent. Making your own soup at home will ensure you know exactly what's going into it and that you are truly staying low-carb. Aren't All Soups Easy Soup Recipes? Yes, they are! All you really have to do is add the ingredients along some broth and seasonings to the pot and simmer until the veggies have softened and meat has cooked. It's really easy to whip up using a Crock-Pot, InstantPot or on the stove top! 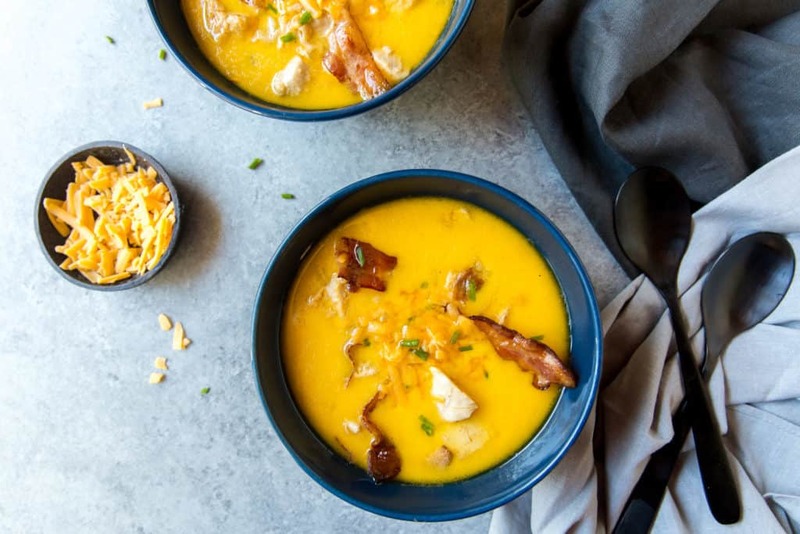 This Bacon Cheddar Soup combines the incredible flavors of cheese, bacon and chicken. High in fat and protein, this soup is great to prep for lunches all week. Other great soups and stews I like to make for prep are our our Broccoli Cheese Soup and Low Carb Beef Stew! If you love soup, this recipe is for you. You can even change up the cheese each time you make it. My personal favorite would be Monterey jack cheese along with fresh grated Parmesan for a peppery kick! When Cheddar Bacon Soup is this easy to make, there is no reason to hold back from making it tonight. 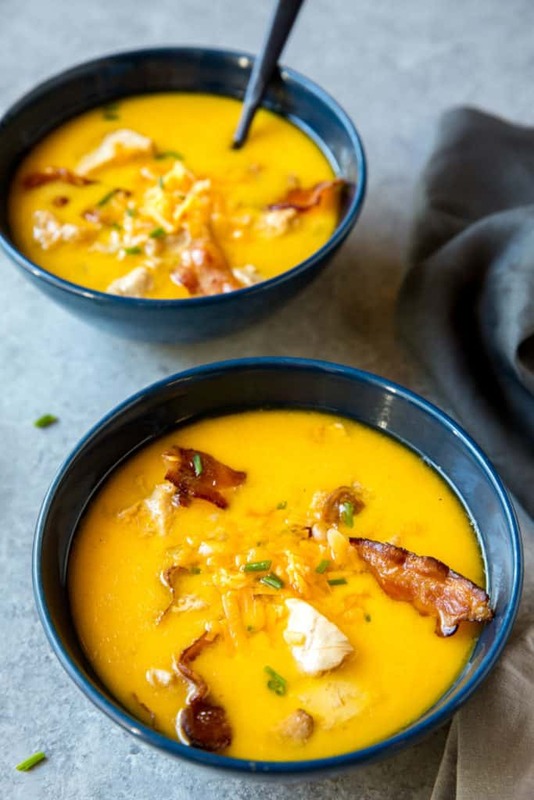 Recipe can be quickly added to MyFitnessPal - Search "KetoConnect - Bacon Cheddar Soup"
Add chopped bacon to a large frying pan and cook over medium-high heat, stirring occasionally, until crispy. Drain well. While bacon is cooking, heat olive oil (or avocado oil) in a large pot. Add chopped onion and celery and saute over medium heat, 5 minutes. Add butter and chicken broth to pot and bring to a boil. Season with salt, pepper, and cayenne. Reduce heat and simmer 10 minutes. Add cheese and cream and stir until melted and well blended. Stir in chicken and ¾ of the bacon. Taste and season as needed. Serve garnished with bacon, more shredded cheddar, and chives.